A standard expression of the distillery, Penderyn Legend has aged a few months in Madeira wine cask, with a first maturation in Evan Williams Bourbon barrels. A standard expression of the distillery, Penderyn Legend has aged a few months in Madeira wine casks, with a first maturation in Evan Williams Bourbon barrels. This whisky is 41° ABV and develops a subtle and well-balanced character. Penderyn Legend picked the gold medal in the European Premium Single Malt category, at the World Masters 2015. This expression reveals a round richness and fruitiness of the unique distillery of Wales. 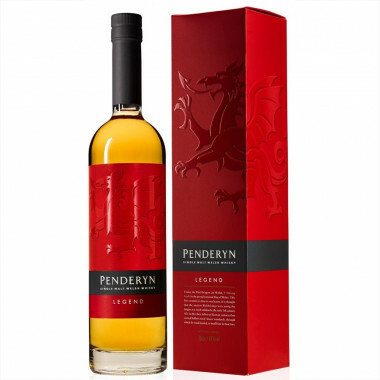 This spirit is presented in a beautiful case featuring the red dragon, that has been blazoned on the Royal Welsh Badge since 1953, with the motto "Y ddraig goch ddyry cychwyn" - "The Red Dragon inspires action". A fiery creature introduced to Wales by the Romans, the Dragon long remained a symbol of the Celtic King such as Henry Tudor, last King of England crowned on the battlefied in 1485, and now embodies all Welsh things. Nose: sweet with fresh and appealing notes of green apples and citrus fruits, intermingled with rich fudge flavours. Palate: fresh and lively, fruity with honeyed vanilla and dried fruits, with a hint of bitterness for a refreshing mouthfeel sensation. Finish: a whiff from the Madeira wine cask finish, with dried fruits notes. Gold Medal in the European Premium Single Malt category, World Masters 2015.